You are here: Home / Allgemein / Startups@Reeperbahn Pitch 2017: We already have 5 winners! With the event taking place for the fifth time, somewhat of a tradition has been established. All the more so, when this involves an event arising from the often transient world of startups. This is also the case for Startups@Reeperbahn Pitch and the preceding board meetings to determine the finalists, which have already been established as traditions. 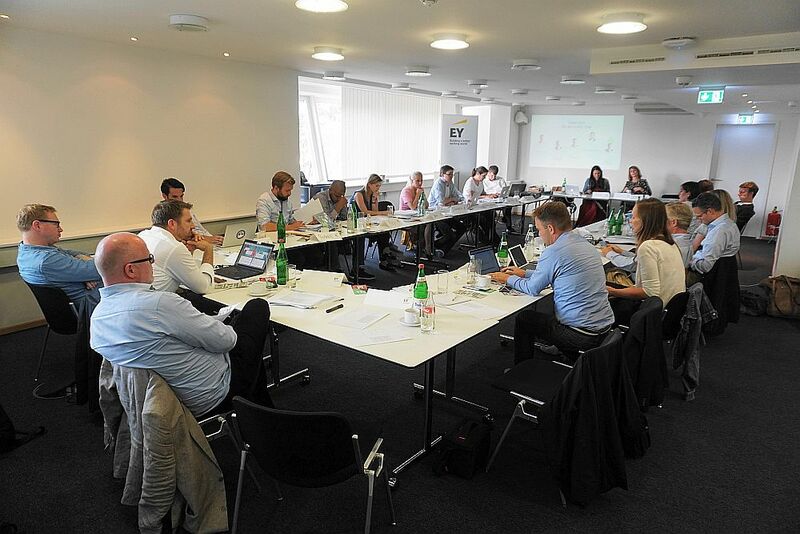 The consulting firm EY and their partner and head of the startup initiative, Jan Brohilker, have been there from the beginning. EY has provided us with the conference room for the meeting and has also organised a meal to follow in the Italian restaurant, Cucina D’Elisa. 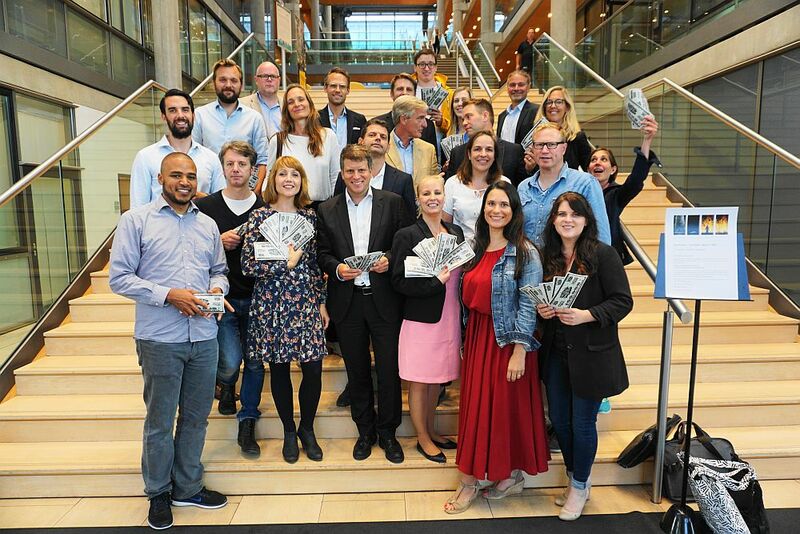 A big thank you goes out to you here from Hamburg Startups for the long-standing support! Another tradition is the line-up of a leading panel of experts on the board: every one of the 25 final candidates (selected previously from approx. 120 applicants) gets a mentor to advocate their case. This is a tried-and-tested principle, as startups have widely varying business models and product ideas. These are often very specific, thus experts are necessary to be able to comprehend and explain everything to those who do not otherwise concentrate so intensively on the topics. All 25 of the board members belong to the startup scene and are represented as experts several times in each area. However, tradition is far from being routine. For one thing there is the re-shuffling of the line-up of the board every year, even when some participants have been actively involved several times. For another thing the startups which have applied come along with fresh ideas and innovative products, so that no one gets bored for a second – even when the discussion concerning the candidates goes on for over several hours. Still nobody asks for a break. Each member of the boarddistributed their dollars to their favourite startups. This startup from Berlin is offering no light menu here; their offer is spiced with current topics such as “Big Data” and “A.I.” Inspirient helps companies to analyse and evaluate mass data effectively, which is now ubiquitous as a result of digitalisation. And they certainly don’t work by the book, rather they utilise methods that can be assigned to A.I. Hence, the algorithms that are used for this adapt to customer’s specific characteristics and requirements. They don’t receive results as confusing tables and columns of figures, but rather as results prepared graphically and consequently, suitable for presentations. 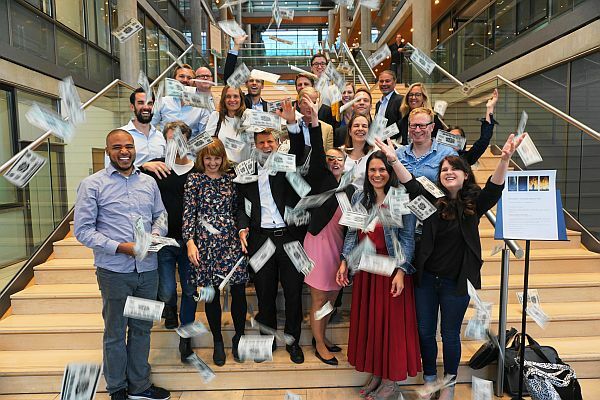 You can get excited about whether or not the founders, Dr Georg Wittenburg und Dr Guillaume Aimetti, have public appeal when they present their ambitious product in the pitch. 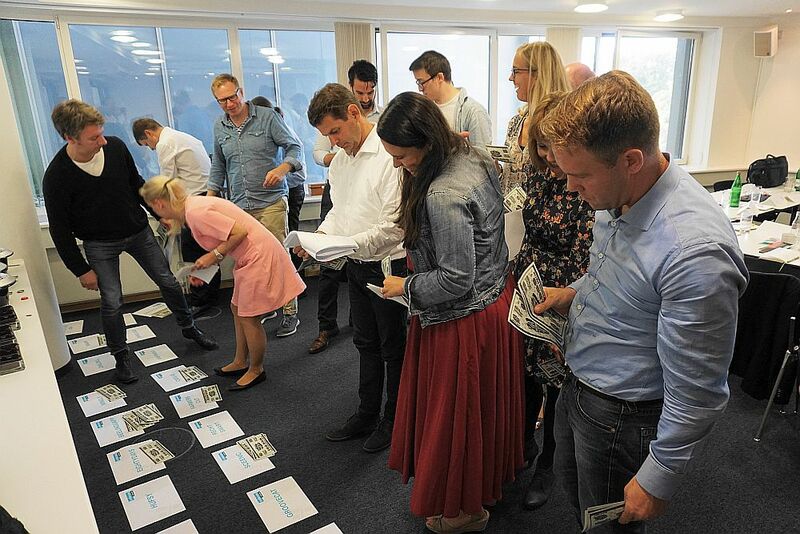 The second finalist may well be best known to our regular readers of the Hamburg Startups’ blog. Nect has won a series of competitions this year, and so the founding duo (Benny Bennet Jürgens and Carlo Ulbrich) has plentiful experience in pitching. This star arose at the beginning of this year; their product is a form of digital ID, which will be officially available at the beginning of 2018. The market potential is deemed optimal here, as present registration procedures over the internet are mostly laborious, and neither do they conform to cutting-edge technology security. Linear TV is passé; that is, in a day and age of streaming services and media libraries, the individual has become his/her own programme director. Exceptions are live events, such as major sporting events or the Eurovision song contest. TV then once again evolves into the campfire, around which family and friends congregate to discuss all. However, loved ones often live all over the world, hence watching and experience live events together is not possible. The startup Sceenic, based in London, wants to change this. Users arrange to meet for a live show and participate in the broadcast via webcam on the screen’s border. In this way, all participants can see and hear each other and are able to cheer on any successful tactics, and curse over missed penalties. It’s hoped that the pitch made by the international team lead by founder Paul Bojarski will ultimately be an emotional event. Just as Nect, Taxdoo also originates from Hamburg and has been very much at the forefront of several competitions. Above all, this startup solves the issue for those operators of online shops who are not so experienced and have to struggle with accounting matters i.e. tax invoices. It gets really complicated when one must deal with foreign customers, as in many European areas, there is an impenetrable jungle out there of taxation laws. Taxdoo’s software helps you find the way and saves its users a lot of money. The founding trio, Dr. Matthias Allmendinger, Roger Gothmann and Dr. Christian Königsheim will undoubtedly give an example of its use on 20 September. It goes without saying that nowadays children grow up with computers, tablets and smartphones. In contact with such digital technology, it is important not to become a passive consumer. “Hey Monster” is an app that brings about the opposite. With this, children can learn German or English; they can create their own stories and turn these into animated images. Along the way, they also acquire their first programming skills. 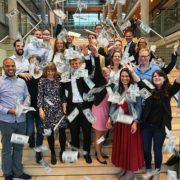 The startup TechSpaghetti was founded by the couple Leah Hinton and Elliot Tabachnik, who originate from New Zealand and have set up their new home in Berlin. We hope for a monstrously good performance at Startups@Reeperbahn Pitch! Well done! The board has founf the five finalists and is looking forward to the big pitch. To finish off, we would once again like to sincerely thank all members of the board; you have once again enriched the rounds with your contributions, for which you have shown full commitment and professional competence. You have made time fly! We are already looking forward to what will undoubtedly be a magnificent pitch on 20 September at Gruenspan! 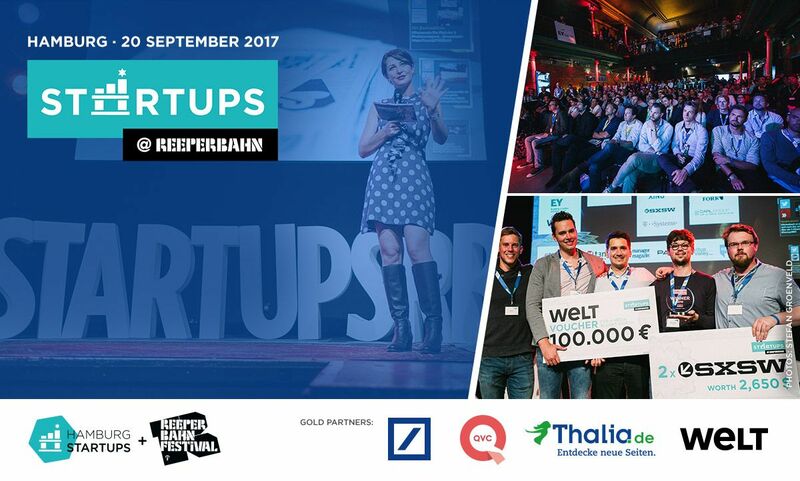 Get your tickets now for Startups@Reeperbahn Pitch –and be there on 20.09!